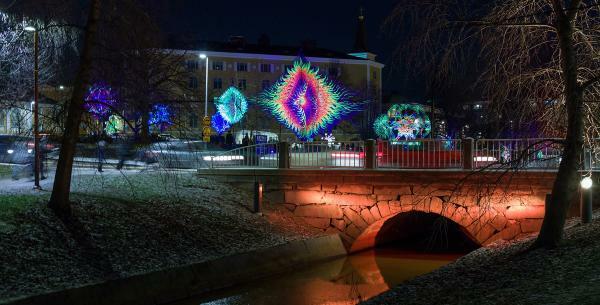 Lumo Light Festival Oulu is inviting artists, designers, light artists and lighting professionals as well as students and institutions to submit their proposals for the 2019 event by March 25th. Read on for info from their callout or visit their website for full details and to apply! Lumo Light Festival Oulu, now organised for the seventh time, is inviting artists, designers, light artists and lighting professionals as well as students and institutions to submit their proposals for the 2019 event. Lumo Festival theme for 2019 is OUR NATURE. The festival is calling for content that delves into the nature around us, or into the human nature in a way that provides and provokes powerful visual and emotional experiences. Lumo is a multi-disciplinary arts festival, which means that we are looking for light-utilising content from different fields, like music, dance, theatre, installations, and workshops. Artists are asked to submit their proposals by 25 March 2019. Lumo Light Festival will take place from 22 to 24 November 2019. The artworks are open to the audience every evening between 4–10 p.m.